While it would be foolish to expect anything less than absurd from Volition at this point concerning anything to do with Saints Row, it’s still a delightful surprise to see whatever comes down the pipeline from the developer. This time, it involves the pre-order bonus for Saints Row IV, dubbed the Commander in Chief Edition. Volition has already revealed that the Player becomes President of the United States at some point in the game, so this edition is fitting for any up-and-coming president. The Commander in Chief Edition features an Uncle Sam outfit, as well as a Screaming Eagle Jet that “fires rockets out of its talons and can invoke the ‘Sonic Scream attack, leaving your enemies dazed, confused, and likely scarred for life,” However, it’s the third item that should really catch your attention: The ‘Merica Weapon, a multi-barreled, star-spangled behemoth of a gun that appears to incorporate multiple weapons from the main game, including the Dubstep gun. The Commander in Chief Edition is $59.99 on consoles and $49.99 on PC, and gamers will receive a free upgrade to the Commander in Chief edition when they pre-order the game. Saints Row IV releases August 20 for Xbox 360, PlayStation 3, and PC. 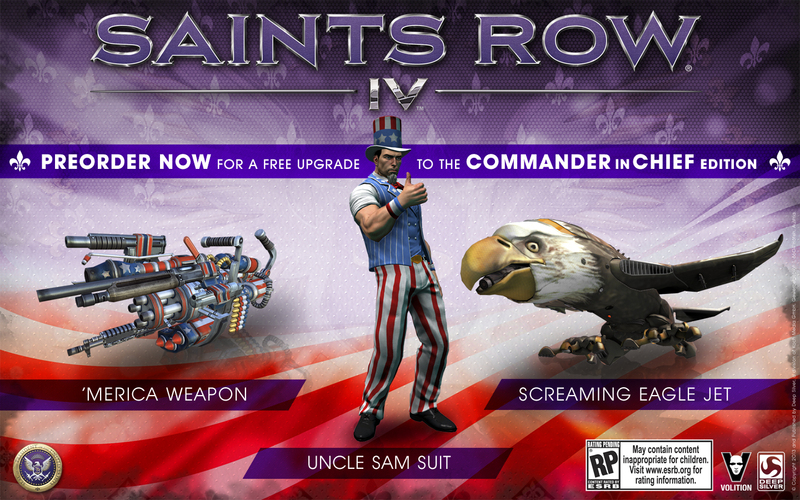 Does the Commander in Chief Edition make Saints Row IV the next great thing? Nerd out with me (or tell me why I’m wrong) in the comments, or discuss the insane progression of the franchise in our forums!